James Boysen’s had every major organ of his body falling apart when he went into the operation theater at the Houston Methodist Hospital two weeks ago. With a damaged pancreas, a worsening kidney and a radiation wound on his head which refused to heal, James was in a pretty bad shape. The 55 year old left the hospital on Thursday with a new pancreas, new kidney, a new scalp and a new skull. In the words of one of his surgeons, James got a new lease of life. 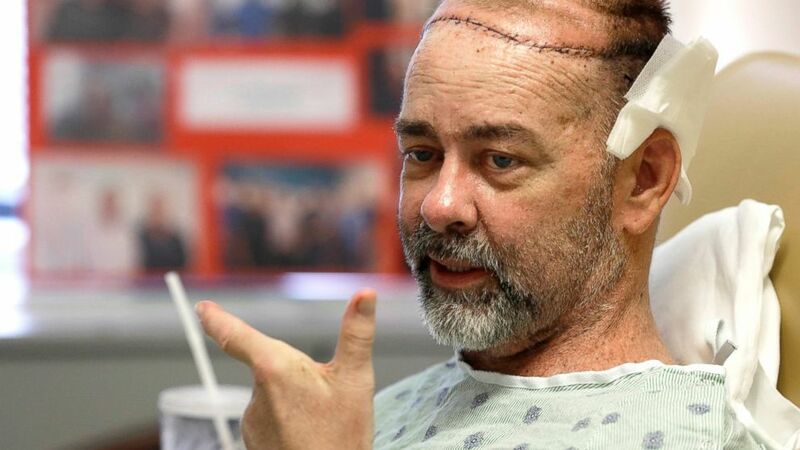 Doctors from the MD Anderson Cancer Center and Houston Methodist Hospital declared on Thursday that they have accomplished the world’s first partial skull and scalp transplant. James will be probably the world’s first recipient of a skull and scalp transplant. It is a tricky operation which involved grafting new bone and skin into the head. Numerous blood vessels whose size was no more than a pin head had to be reconnected to keep the blood flowing in the transplant. It was one hell of a job and the only solution for James endless list of ailments. James Boysen had been facing a number of health problems for the last two decades. He had dai8betes since the age of 5 and the complications’ eventually damaged his pancreas and kidneys. He received a Kidney and Pancreas transplant in 1992. To prevent his body from rejecting the grafts, he had to take immunosuppressive drugs which ultimately made his body vulnerable to cancer. He developed leiomyosarcoma, a rare disease that affects the body’s “smooth,” or involuntary, muscles. In James case the cancer attacked the cells under his scalp – the cells which made the hair stand on end when you are afraid. Radiation therapy to treat the cancer led to a large part of his skull getting damaged due to the immunosuppressants he was taking. The wounds was not healing and years later as the new pancreas and kidneys started to fail, doctors knew that they had to find replacements while Boysen has a gaping wound on his skull. It was in 2011 when the doctors reached this conclusion. Now the wait for a donor which ended on May 21, news came that LifeGift, the organ and tissue donation non-profit, had found a candidate. In less than 24 hours , James was wheeled into the surgery and was operated by a team of a dozen doctors from MD Anderson Cancer Center and Houston Methodist and ably assisted by another 40 para medical and health workers. First came the turn of Boysen’s scalp and skull. 15 excruciating hours which involved carefully remove parts Boysen’s scalp and skull and the replacing it with a 10-by-10-inch skull graft and a 15-inch-wide piece of skin. Then they transplanted Boysen’s pancreas and kidneys. One final bright spot- Boysen has more hair on his scalp than before. Was Global Warming Responsible For Ending the African Drought?